Very similar things can be said about the neighbouring region of Sportwelt: The name says it all, it is the Salzburgerland′s hot-spot for sporty activities. Skiing, snowboarding, mountain biking, hiking, Nordic walking - you name it. The Salzburger Sportwelt, the ski heartland of Salzburg, boarders to the region of Obertauern, which is more or less dead during the summer, but one of Austria′s grandest skiing towns once the winter season kicks in. Obertauern is a tourism ghetto, but an economic powerhouse for the Salzburgerland. West of the Salzburger Sportwelt, you find the small destination of the Salzburger Sonnenterasse, which comprises of only two communities. 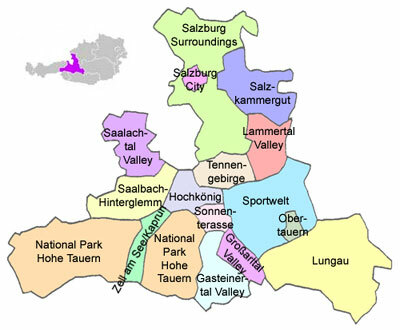 The outer-most south-eastern corner of the Salzburgerland is the Lungau, an area culturally related to nearby Carinthia. Less prominent for skiing than Obertauern′s surroundings, the Lungau is very popular for hiking holidays off the beaten track. Historic villages and many local customs and traditions make the Lungau one of the Salzburgerland′s most attractive regions. Moving westwards, you will get to the Großarltal. This valley is again very famous for its splendid skiing opportunities; towns like Großarl rival the fame of Obertauern - similarly, little goes on there during the summer season. This is somewhat different one valley further west: The Gasteinertal Valley is a year-round destination famous for its "fin-de-siecle" atmosphere. Bad Gastein is one of Austria′s oldest Imperial spa towns. In the valley, you find great slopes and skiing opportunities as well as several Thermen or hot spring spas. The towns are worth a closer look and hiking opportunities are excellent. Due to the large number of hotels in the Gasteinertal, the valley has a superb infrastructure and is among the most popular in the Salzburgerland. Another attraction of Bad Gastein is the local Casino, situated in a 19th century spa hotel with all the pompous splendour of this era. Even further West, the National Park Hohe Tauern is waiting for you. Due to its status as a National Park, skiing opportunities are very limited. Hiking is much better; plus, the Salzburgerland′s primary attraction can be found here: The Großglockner Hochalpenstraße, a panorama road that takes you directly to Mount Großglockner, the highest mountain of Austria. Here you will also see some of the biggest glaciers of the Salzburgerland, altogether northing but a breathtaking piece of scenery. Another thing not to be missed in the National Park Hohe Tauern are the waterfalls of Krimml - the highest not only of the Salzburgerland, but of all Austria. The smaller regions of Europa Sportregion Zell am See / Kaprun and Zell am See offer the usual blend of skiing and hiking opportunities. Zell am See has the beautiful city by Lake Zellersee and the dams of Kaprun as additional selling points; as well as summer skiing opportunities due to the nearby glacier on the Kitzsteinhorn. Zell am See allows you to go skiing in the morning and swim in the lake in the afternoon - unusual, even for the Salzburgerland. The region of Hochkönig also has a glacier, but it is mostly the winter season that attracts visitors. Some of the most popular ski resorts of the Salzburgerland can be found in the Hochkönig region, which consists only of a handful of municipalities and the mighty mountain of the same name. The destination of Skicircus Saalbach-Hinterglemm / Leogang is not dissimilar from Obertauern: Especially the twin-town of Saalbach-Hinterglemm is a wild party town during the skiing season, but rather dead during the summer. Nearby Leogang joins in neatly along the same lines. Noteworthy are the excellent connections to Salzburg airport. Finally, the Salzburger Saalachtal is less touristy than its southern neighbours: More gentle mountains wait for families with children and beginners both in hiking and skiing. The area is fairly close to the city of Salzburg and by no means crowded in terms of tourism. A nature experience in the Salzburgerland, that - combined with a car - is guaranteed to please everybody looking for mild blend of Salzburgerland′s attractions and a central location. Keeping this guide in mind, you should plan your stay in the Salzburgerland in advance based on your needs and preferences: Do you have a car or do you require public transportation? Do you travel to the Salzburgerland for a family vacation or for wild après ski parties? Do you want the vicinity to Salzburg City or do you want to meet locals? No matter what you want, the diverse Salzburgerland will provide it as long as you know where to look for it!